As if night-time ratings dominance were not enough with two decades of The Tonight Show with Jay Leno, Leno has also succeeded as producer and star of Jay Leno’s Garage The NBC creation, which is viewed on CNBC, gained an international following on the Web, and an Emmy Award. 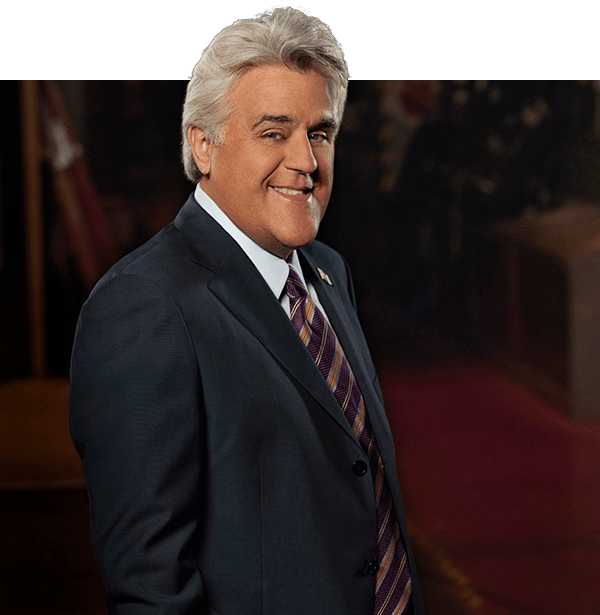 An indefatigable performer, Leno loves to test his humour live on audiences across the nation, performing over 100 live appearances in nightclubs, theatres and stadiums each year, including during his long Tonight Show hosting. When he is not performing, writing, doing charitable work, Leno keeps busy doing voice-over work in such movies as Cars and “Igor” and the hit-TV show The Fairly Oddparents (Nickelodeon), where the character “The Crimson Chin” – a superhero with a chin with superpowers – was inspired by Leno’s own noted jawline.